Leo B. Blake received a thorough education in art at the Art Institute of Chicago where he was a student from 1908 to 1912. His instructors at this time included such notables as J.H. Vanderpoel, Alphonse Mucha, Allen Philbrick, W.J. Reynolds, Antonin Sterba, and F. DeForrest Schook. He also received special training under Mathis Alten, Birge Harrison, Conway Peyton and Alfred East. While at the Institute, he was honored with two scholarships in 1910 and 1911. After emerging from the Art Institute of Chicago, Blake began his career in illustration and commercial art and continued his residence in the Mid-West until he decided to break away and work as a free lance painter according to his own ideas and preferences. 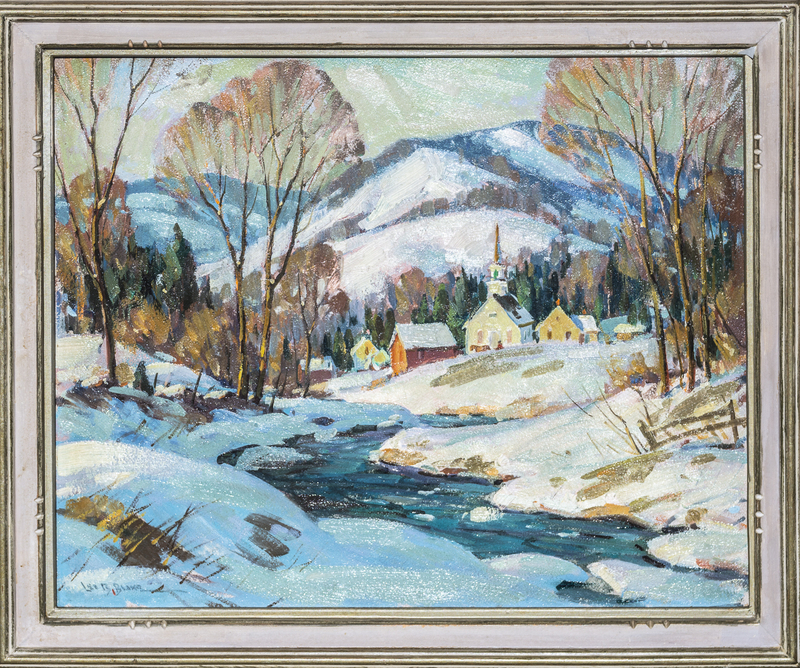 He set up a permanent studio in the Berkshires in 1933. Blake spent the rest of his career depicting landscape and seasonal changes around New England. Blake was an active member of the Salmagundi Club, Illinois Academy of Fine Arts, Pittsfield Art League (President 1935), Berkshire Business Men’s Art League, North Shore Arts Association, Connecticut Academy of Fine Arts, New Haven Paint and Clay Club, Springfield Art League, and the American Artists Professional League. Blake exhibited throughout the country at many fine institutions including at the Art Institute of Chicago, Illinois Academy of Fine Arts (award, 1931), Allied Artists of America, Berkshire Museum, Connecticut Academy of Fine Arts (award, 1939), Salmagundi Club (award, 1942), Philadelphia Art Alliance, and Syracuse University. Blake’s work is represented in the permanent collections of the Illinois State Museum, Mechanics Institute of the Rochester Institute of Technology and the Berkshire Museum, Pittsfield, Mass. 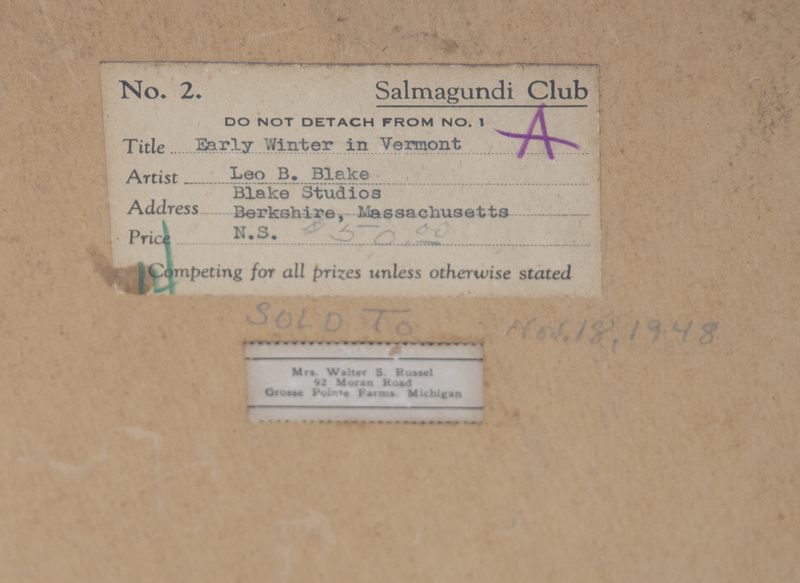 Blake taught painting at Williams College from 1937 to 1941 and at the Berkshire Museum from 1943 to 1953. He also taught at the Lenox Art Study Group, Lenox Library, Great Barrington Painting Class, Great Barrington High School, Crestalbal School for Girls, Junior League of Pittsfield, and Blake Studios Summer School.